Six Mercury Bay Area School students traded Whitianga for Nepal during their recent school holidays. 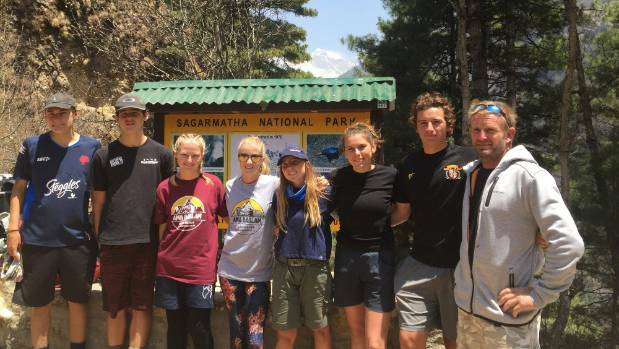 Through the Youth to Everest programme, the six students joined 12 others from schools around New Zealand for a 16-day adventure through Nepal, gaining an insight into the life of the local communities. Bianca Harsant-Sowter, 15, said 11 of the 16 days saw them do a round-trip trek from Lukla to their highest point at the Ama Dablam base camp - approximately 5000 metres above sea level. She said many of the students decided to go because it was "outrageous and out of our comfort zone". For the MBAS students, they all lived rurally and had never really travelled before. Isabella Ramage, 16, said she found landing at Tenzing-Hillary Airport "weird". The airport is often considered the most dangerous in the world because of its small runway length and that it sits on a cliff-edge, she said. Another student, Nikita Russell, 16, said she was amazed at how people "live so simply compared to us". As part of the trip, they were supposed to do community work. However, they were unable to as the suppliers were not able to arrive in time, Russell said. Instead, they visited an orphanage and spent time with the children there, which Nikita said was a highlight of the trip. Another highlight for her was being able to walk up to the Sir Edmund Hillary memorial. Trinity McQueen, 16, said he got a bit of a culture shock during the trip, but was pleasantly surprised at how clean Nepal was. He said people made efforts to clean the tracks that they were walking, and "positive changes" were happening in the communities to provide services to help people who needed it. Nikita said it was important that they went into the "very open-minded" for the instances where they saw big cultural differences. Aside from living conditions, she said other differences they noticed were walking the trails and not seeing any vehicles for a very long time and also how surprised other tourists were that they were visiting Nepal at such a young age. बेहाल सडक नेपालमा कहिलेसम्म ?